There are certain products from the drugstore that I can't live without (I've talked about some of my favorites here and here). You know those products that are under $10 but are so great that they seem like they should be much more expensive? I first started using Suave's dry shampoo this past summer and was instantly hooked on it, and it has remained my favorite dry shampoo since. Then I noticed Suave Professionals® came out with Moroccan Infusion Dry Body Oil Spray and Body Lotion and I've been using them this past month when winter has really taken a toll on my skin. My skin has been getting extremely dry, so I will use the Dry Body Oil Spray immediately after I get out of the shower and my skin feels so smooth and hydrated after. It doesn't leave a greasy residue behind and I can count on it to help my skin feel moisturized. The Body Lotion is rich and creamy, and has such a light refreshing smell. I love to use this lotion before I go to bed at night and it keeps my skin hydrated throughout the night and the following day. I don't go a day without using this lotion! The best part? Both of these products have Moroccan argan oil in them so they are full of nutrients and antioxidants that are amazing for your body and at a price that you can afford. I'm absolutely obsessed with argan oil now and consider these a big part in my beauty routine! Suave® Body Care has done it right this year with these products. They get A+'s all around from this girl! If you haven't tried them yet, I highly recommend adding these to your cart on your next shopping trip! You can find more information about the Suave Professionals® Moroccan Infusion Body Care products at www.Facebook.com/SuaveBeauty and to get tips for radiant skin, style advice from celebrity stylist Brad Goreski and enter the "Radiant Wishes" sweepstakes for a chance to win Suave Professionals® Moroccan Infusion products, a spa day or a trip to Los Angeles. **For a chance to win a $1000 gift card, let me know which of the Suave Professionals® Moroccan Infusion Body Care products you would most like to try! This sweepstakes runs from 2/7/2014-2/28/2014. Be sure to visit the Suave Professionals® brand page on BlogHer.com where you can read other bloggers’ posts! I'd like to try the body lotion. I could definitely use some of the dry body oil! I love their dry shampoo so I would love to try more of their products. My skin is so dry so the lotion sounds great! i'd love to try that body lotion. i get so dry in the winter! I love the dry shampoo! Going to have to try the dry oil! I would love to try that body lotion - my skin has seen better days this winter. The oil is tempting too though! I would love to try the body lotion! What a great giveaway! I think that lotion is on my next Target trip list.I have had such dry skin this season and I think grabbing this for my desk at work would be perfect. I love Suave as a brand and also want to try the Moroccan Infusion Deep Conditioning Shine Mask from the professional hair treatment line. I would love to try the dry oil! I love Suave so much! I really want to try the body lotion! I would definitely want to try the body oil! It's been really cold here in Texas and my skin is getting so dry! I would love to try the dry oil. Ugh with this cold dry weather I am dying for some great lotion. Would love to try this brand! I would love to try the body oil!! I would like to try the oil with this dry winter. i would love to try the lotion! my skin is terribly dry this winter! I would love to try the body lotion! I would love to try the body oil! I have already used the moroccan oil shampoo and conditioner and I love them! I would love to try the body lotion!! I'd love to try the body oil! I'd love to try the body lotion. I would love to try the lotion! I love the dry shampoo- and have been a suave girl forever!! Their body lotions are great and not too sticky either! I would love to try the dry oil...! Maybe in my next shopping cart! Moroccan oil is a miracle worker for my hair and scalp so I can imagine the benefits of using it on my skin. With spring and summer coming, I will be using the Suave Infusions to polish up some of this winter dryness. Thanks for the tips. I would love to try the body lotion! This long winter is getting to my skin! With this crazy winter I would definitely try the body lotion! I do believe that is for sure going to "fall" into my cart next time I go shopping!! I'd really like to try the dry body oil spray. It's so dry here, I'd love to try the body oil. I'd like to try the dry body oil that sounds really cool. I love the dry shampoo, so I would love to try the lotion! With all this cold dry weather I would love to try the body lotion!! The Body Lotion is what I'm buying first at my next Target run! I would love to try the dry oil! I need to rehab my winter skin! I have GOT to try that body lotion!! All of the products sound fabulous but I would most like to try Suave Professionals® Moroccan Infusion Body Lotion. I live in a very cold climate and my skin tends to get dry, this new range would really help my skin feel refreshed and I would smell great too! I'd love to try the body lotion! I'd like to try the body lotion! I would love to try the Suave professionals Moroccan Infusion Lotion because my hands are constantly dry due to living in a dry climate and washing my hands at my job. I really want to try the dry oil body spray! I want to try the Suave Professionals® Moroccan Infusion Body Lotion. I'd really like to try the Dry body oil spray. I can't stand feeling greasy. I would love to try both the body lotion and the body oil spray. My skin is awful during the winter season. I would like to try the Suave Professionals Moroccan Infusion Body Lotion because I have dry skin. 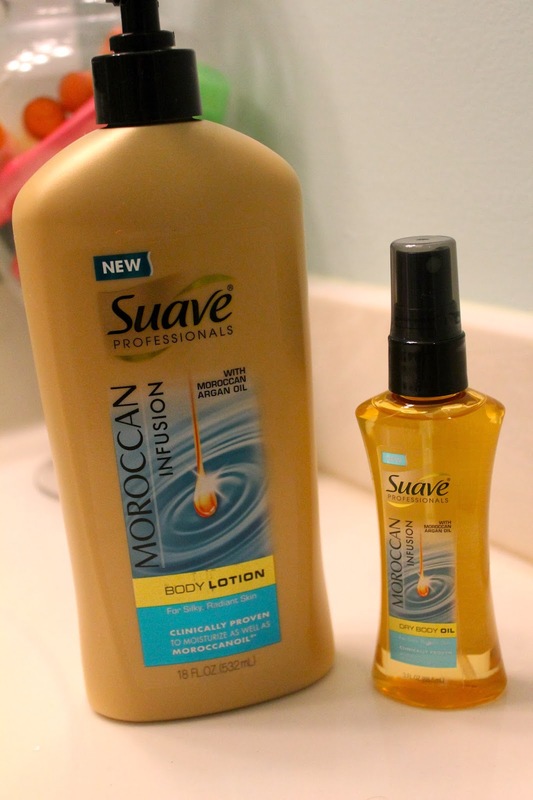 I would love to try the Suave Professionals® Moroccan Infusion Body Lotion! Thank you so much for offering such a wonderful giveaway! I would most like to try the Moroccan Infusion Lotion. I have extremely dry skin and am always searching for my miracle cure. Suave Professionals® Moroccan Infusion Body Lotion -- my skin is so dry!! I'd like to try the Dry Oil Body Spray. I love oil instead of lotion - keep skin so much softer! I would love to try the Dry Oil Body Spray on my super dry legs. Def going to have to try the Dry Oil Body! I love their dry shampoo so much. I'd like to try the dry body oil spray. I'd like to try the Moroccan Infusion Dry Body Oil Spray. I love Moroccan oil but I've never tried Suave's. Looks like I'll have to check it out! I went out and bought the lotion and I love it! Smells amazing and feels great! I want to try the Moroccan Infusion Body Lotion. I'm starting to get dry patches and am hoping for something that will leave my skin soft and itch free. The body lotion would be nice. I would love to try the lotion, it sounds wonderful! I'd like to try the dry body oil spray. It sounds like a really great product. My skin is so dry! I'd love to try the Dry Body Oil Spray in it. I would love to try the Moroccan Infusion Dry Body Oil Spray. I want to try Suave Professional Moroccan Infusion Oil Lotion.